As you know Scott Weingart from EM:CRIT has come on board for DEM2015. 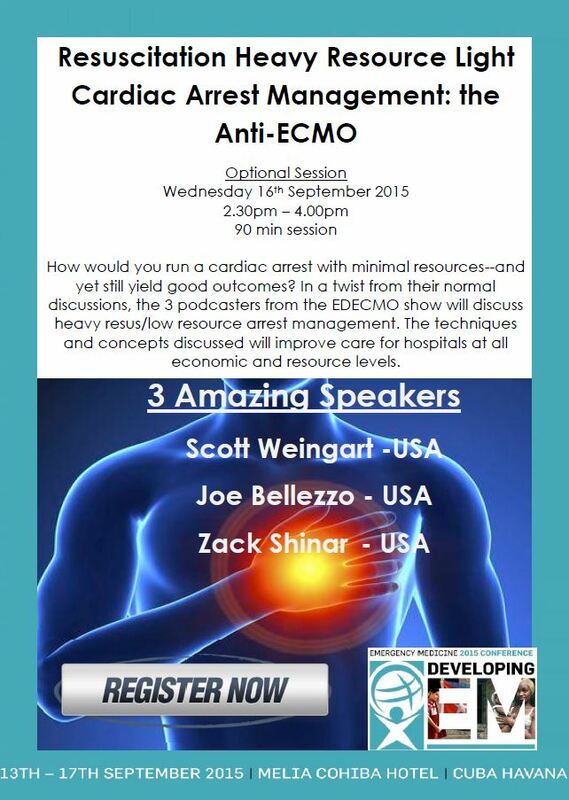 Now he’s recruited Joe Bellezzo and Zack Shinar from EDECMO.org to host a new workshop for us in September. It’s a 90 minute session on Wednesday 16 discussing the approach to high quality resource light cardiac arrest management. E-CPR is all the buzz at the moment but for most of us it’s just not an option so how do we continue to provide high quality management of arrested patients in the 21st century. Scott, Joe and Zack are going to tell you how. Join them for what will be a highly anticipated session at DevelopingEM 2015.